Clay on Main offers rolling enrollment for all ceramics classes. 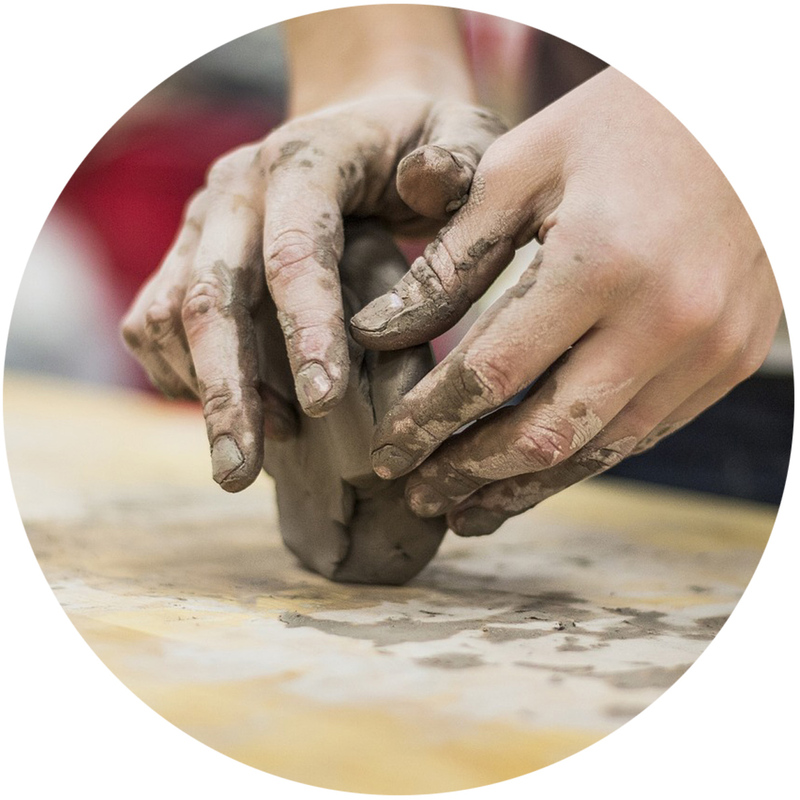 Whether you’re new to clay, or have some experience, we offer classes for all skill levels. Classes include studio time with an instructor, as well as open studio time for added time working on projects. Be sure to read our GENERAL STUDIO INFO if you’re considering registering for a class. and glazing. Bring your ideas, designs, and questions and get going! Class size: 10. This class is for students with some clay experience. Development of more involved hand building techniques, throwing on the wheel, and an introduction to glaze chemistry will be offered. Class size: 10. $175 members (Use your member code. ); $210 non-members. Instruction provided in throwing cups, bowls, plates, vases, and more on the potter’s wheel. Students looking to explore hand building or other techniques are also welcome. Specialized instruction with an expert on the potter’s wheel.. Clinic offered once a month. Call studio for details. $35 for single session. Enrolled students can use this time, at no extra charge, to work on in-process pieces or start new ones. A studio monitor is present to provide access to the studio, and any needed materials. Ceramic Sculpture Class (Wednesdays 12-2 PM) Learn everything about creating ceramic sculpture, from basic concepts and building techniques to more advanced skills. Knowledge of clay, glazes, and other materials is explored. Experimentation is encouraged, and all levels of experience welcome. $185 members (Use your member code. ); $210 non-members. Do you desire an opportunity to pursue your own direction and ideas? Do you need flexibility in scheduling your studio time? The Studio Associate Program allows members of Clay on Main access to all open studio times, which are overseen by a monitor instead of an instructor. This program is limited to returning intermediate and advanced Clay on Main students; you can apply after you’ve taken at least one six-week class. This requirement ensures that you have the skills to work independently and gives us a chance to orient you to our particular studio and community. Open studio times are posted on the Classes page of the website. We do not charge a materials fee for glazing and firing, but we do require that you purchase clay from us; the $35 per 25 pound bag covers our costs. The fee to participate in the SAP is $100 a month, due on the first day of the month. Students work independently during the sessions. No instruction or demonstrations are given, but the monitor is available to answer questions. Design and construct a functional birdhouse. All ages are welcome; students 12 and younger need to be accompanied by an adult. Instruction provided in the construction of functional work such as dishes, and imaginative sculptural forms- a chance for kids to express their creativity while they build focus and learn the science of clay. 4 Classes $100. Ages 6-12. Summer can be a great time to expose kids to some new activities. Ceramics is a medium that is very accessible to beginners, and also teaches children valuable skills in Clay on Main is offering a weekly class for students ages 6 to 12 to explore their ideas in clay. Parent must remain at the studio during class. $100 per 4 week session. Kids ages 6-12 will spend five days learning, playing and creating in Clay on Main’s ceramics studio. Each of the first four days will focus on ancient times in a different part of the world: Asia, the Middle East, Europe, and the Americas. Using techniques and materials from each, we’ll create a ceramic vessel or sculpture; we’ll also explore other crafts, music, and food. The fifth day will be our chance to have an informal reception and share our work with family and friends. While expressing themselves creatively and getting to know one another, campers will learn a bit of geography, history, chemistry, and geology. Physical activity is sure to be part of each day, whether we go for a walk on a sunny day, or play active indoor games. Student’s work will be shown during Clay on Main’s Ice Cream Social on July 20th. $300 per child ($275 for each sibling). Clay on Main will provide snacks, but please pack a lunch. Please call the studio when registering multiple children at once to receive a discount: 610-987-0273. Instructors: Liz Wheeler, Ray Lapinski, Jasmine. Also check out our upcoming workshops and events for more ceramic instruction!